Come and adventure on the spectacular granite cliffs of Mt Buffalo. Situated 4 hours drive North from Melbourne, Mt Buffalo makes the perfect location for an adventurous weekend getaway or family holiday destination. With a wide range of abseiling options for all levels of experience Bright Adventure Company will deliver a fun, safe and memorable experience. This experience is great for the first timer or those who are ready for a challenge. This family friendly activity is guaranteed to create unforgettable memories whilst you visit the beautiful Mt Buffalo which is a short drive from Porepunkah and Bright. You will have range of abseils on offer including a 'warm up' 10 meter and a more challenging 25 meter. Have you conquered the beginner abseiling challenge and fancy stepping it up a notch? We have the next step that will deliver heart stopping exposure whilst you launch off the Dragon Foot 45 meter free fall abseil. The adventure is not over once you hit the ground as you then get to choose from a tight squeeze or a short rock climb to get back to the top. Adventure plus!!! 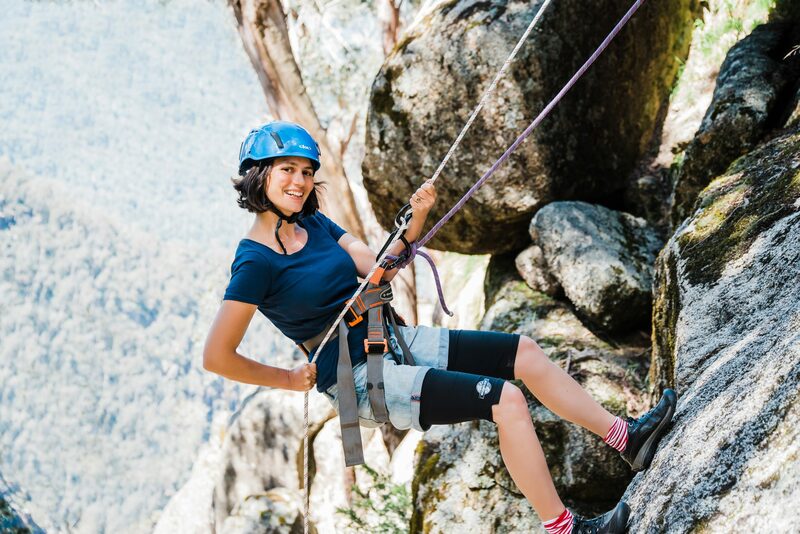 Are you ready to tackle the longest commercial abseil Mt Buffalo has to offer? Over the course of a day you will conquer over 300 meters of abseiling. Your first abseil will be a gigantic 160 meters long and will be followed up with three 50 meters abseils that will get you to the ground. We will then have lunch whilst being surrounded by the majestic granite cliffs that Mt Buffalo is renowned for. The next part of the journey entails rock climbing, scrambling and hiking back up to the gorge rim. This part is an adventure in itself and requires a moderate level of fitness. This is the ultimate team building activity for your staff. Note: prior abseiling experience is required for the Advanced Abseiling Adventure. We are happy to tailor a package for you that provides an introduction to abseiling before moving on to the Advanced Abseiling Adventure. Fully qualified and experienced guides. All required abseiling safety equipment. Sturdy shoes (runners and hiking boots are great, no thongs). Suitable clothing (no short shorts or short tops). Mt Buffalo is an alpine environment so please bring some warm clothes. Long pants preferable. Your own climbing or abseil safety equipment if you would like to use it. Not essential, and needs to be inspected by the BAC instructor before use.